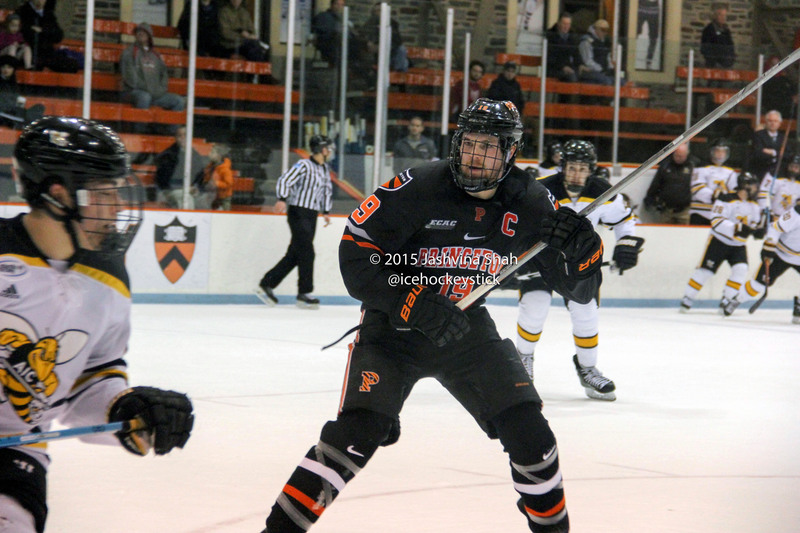 Eye on the Tigers | Your one stop for Princeton hockey coverage. PRINCETON, NJ – Colton Phinney was crouched in front of his net, situated on the side of the arena where the old “Make Hobey Proud” sign used to hang, facing the new banners that lined the press box. And on Friday night Phinney did just that – he made Hobey proud by recording his 2,952nd save to break Princeton’s all-time career saves program record. Hi everyone, I’m back! At least for a little bit as I breakdown Princeton’s surprise success of the first half and how it will translate to the second half. In this piece I will visit two topics – first I will break down the success Princeton is having, where on the scoresheet it is most reflected. Secondly I will break down where that success is coming from. Anyway, thanks to Princeton’s SID, Kristy, I have a handy breakdown of Princeton’s first quarter of this season vs. the second quarter of the season as well as the first half of this season compared to the first half of head coach Ron Fogarty’s first season. This doesn’t mean the blog is back for good, but I would like to post some tidbits on it every now and then – especially because I can still pop into Baker from time to time (like I promised I would. )Anyway, thanks to Princeton’s SID, Kristy, I have a handy breakdown of Princeton’s first quarter of this season vs. the second quarter of the season as well as the first half of this season compared to the first half of head coach Ron Fogarty’s first season. What success are we talking about? The success that stands out lies in Princeton’s record. At seven wins, the Tigers have already surpassed their win total from last season and are just two wins away from tying their combined wins over the past two years. Much of Princeton’s success, at least win wise, has come in non-conference play. Their stretch of seven wins in eight games – which included five wins in a row – began at Bemidji State and ran to the Minnesota State series, which concluded Princeton’s first half. The Tigers won seven games in nine to close out the first half, which included a sweep of Quinnipiac and four non-conference wins. The wins speak much of Princeton’s success alone, but Princeton has been able to win because of its offense. The Tigers have scored four goals or more in seven games this year. That’s far above what they’ve scored in the past. Princeton averages 3.2 goals per game – that’s almost double of what Princeton averaged total last year at 1.94 goals per game. And when Fogarty had just completed the first half of his first-ever Division I season, the Tigers were averaging 1.2 goals per game. Lead the attack is sophomore sensation Max Veronneau, who has 21 points, which is one more than his classmate Ryan Kuffner scored all of last year. That whole sophomore class has been superb, which we foresaw when they were just rookies. Josh Teves is still Princeton’s best defenseman, and he was as a rookie. Kuffner, Veronneau and Alex Riche combine for the all-sophomore line which has the best chemistry and some of the best speed on the team. It helps that Kuffner and Veronneau played together in juniors, so they were blistering from the start of their collegiate careers. Kuffner has 17 points so far this year so will pass his totals from last year shortly. Junior David Hallisey is having a breakout year with 16 points and freshman Jackson Cressey – the HCA Rookie of the Month for December – has 15. His 0.94 points per game is tied for 12th amongst rookies. With the improved offense comes an improved defense. The Tigers average 33.25 shots on goal per game – which ranks 10th nationally – and allow 34 shots per game. At this time last season Princeton gave up 40.08 shots per game – dead last in the league – and averaged 30.23 shots per game. Through the first half of Fogarty’s first season Princeton averaged 23.6 shots per game and allowed 37.6 shots per game. But the difference lies in the quality of shots. In previous years Princet maybe scraped together a good chance or two but was unable to create concrete quality scoring opportunities. And on the opposite end they would often be pinned in their own zones facing a multitude of shots, although last year Princeton did a good job keeping those shots to the perimeter. While we’re on the subject of defense, here are the Tigers goals allowed per game stats – 3.4 goals allowed per game in the first half of 2014-15 (Fogarty’s first season) and last year they allowed 3.19 goals per game. The stats show Princeton’s improvement – and how drastic is has been – but why did they make the jump so quickly? Ok, but why is Princeton so successful? Is it a fluke? It’s not a fluke. The foundation began being built the day Ron Fogarty took over the program in 2014. He stayed committed to making sure the team played the “right way” and “stuck to the systems” (which are big buzzwords for struggling programs). But over his two years, the improvement was evident, even if it didn’t show up on the scoresheet or in the wins/loss column. If you watched closely, you could tell. Now it’s paying off because the Tigers finally have the talent to play in the systems. Fogarty’s systems were good, but the Tigers didn’t have good players or players who could score. Now they do. And that’s the difference. Let’s go back to the sophomore class. It’s made up of forwards Max Veronneau, Ryan Kuffner, Alex Riche, Josh Teves and Austin Shaw. I’ve already talked about Kuffner, Riche and Veronneau and how they make up Princeton’s best line, and Shaw, the goaltender, never plays. But Teves is – and was even as early as last year – Princeton’s defenseman. He’s gotten lost in the outside focus on offense but has still been solid on the blue line. With another year of experience, the sophomores are contributing even more. But the big difference is the freshmen. The Tigers welcomed forwards Jackson Cressey, Joey Fallon, Jordan Fogarty, Jeremy Germain, Liam Grande and Derek Topatigh. On defense Topatigh has been stellar and on offense Cressey, Germain and Grande have been the difference. They’re skilled forwards but most importantly they’re fast. Fogarty had a few years to recruit and the team not has enough talent to play in this system and make it work. Where I see the most improvement is that speed. The freshmen are fast and the sophomores are fast and the Tigers now have a team that can out-skate opponents, which is drastically different from previous years. The freshmen have wings attached to their skates and they’ve made Princeton into a dangerous transition offense team. While the average of shots per game is on par with previous years, the quality of chances have escalated – mostly because they’re created from the speed and skill the sophomore and freshmen bring. Especially the speed. The Tigers have gotten a lot of chances off the transition offense and teams are struggling to keep up with them. This has then improved Princeton’s defense. The Tigers spend little time in their own zone, but when they do they’re strong inside it. They collect the puck cleanly and commit a drastically lower number of turnovers than they did last year. So where will they finish? Good question! There’s still half the season left and now it’s all conference play. Before the year started I pegged Princeton to earn home-ice advantage in the first round and they’re on that path. This is a weak year for college hockey overall and for the ECAC, but while other teams lost their best players, Princeton barely lost anyone and only got better. It’s tough to predict what will happen between now and March, but the Tigers are in a good position to win a majority of their conference games. There are a few tough contests looming – Harvard, Clarkson, St. Lawrence – but if Princeton keeps playing the way it is, look for early March games at Hobey. Princeton hockey alumnus Kyle Rankin signed with the Elmira Jackals of the ECHL in the August to continue his professional career. “They reached out to me and I had a good talk with the management and the coaching staff and it seemed like a great fit and a great place to start my first professional season,” Rankin said. Rankin began his professional career with the Brampton Beast, joining the team in March after the conclusion of his Princeton career. He played in six games and registered zero points. The Sioux Falls Stampede alumnus spent his summer working out at Fitquest, an organization run by Ottawa Sentator strength coach Chris Schwarz. Rankin said he worked on off-ice conditioning but focused on on-ice training. Rankin played in 117 games over a four-year period with Princeton and served as a co-captain in his senior year. He scored 31 points. Last season, Rankin appeared in 31 games, registered nine points and earned the team’s award for dedication and perseverance. Mark Milley stood inside the Tampa Theater, a 90-year-old building with small velvet seats and an overhanging balcony. He smiled on the stage in front of a starry sky and a cardboard cutout of a castle, accepting his Lou Lamoriello Award. Medals filled the left side of his chest, denoting his status as the country’s Army General, a montage of red, green and blue. He’s formidable in stature with grey hair contrasting against his dark jacket line with gold rims on the sleeves and shoulders. The award, honoring a college hockey alumnus with a distinguished professional path, was presented just before the Hobey Baker Award. Like Hobey Baker, Milley too had played college hockey at Princeton. But after accepting his award, after posing for photos and engaging with fans, the Army General stopped to speak to a child the quarter of his size. Milley jested, telling the kid – a Minnesota native – that if he wanted to play hockey, he’d have to move to Boston. The city on the Charles was close to where Milley himself, a Winchester, Mass., native playing prep school hockey at Belmont Hill, started. When time for college arrived, Milley remained on the East Coast and took the five-hour trip south to Princeton. Milley had applied to different schools, but the old Ivy League college – with grey stone buildings, its campus locked in time and historic rink that paid homage to the greatest player in college hockey – enchanted Milley. While he dressed in black and orange, Milley skated on the same ice with and against bogeomeths of college hockey – from the powerhouse BU teams driven by Mike Eruzione to Clarkson’s Dave Taylor. “All that 1980 Olympic hockey that came from the East, I played against all those guys,” Milley said. While a Tiger, Milley played with current writer and producer David E. Kelley. Kelley worked on a range of shows including The Practice, Ally McBeal and Boston Legal. In 2014, Kelley was inducted into the Television Hall of Fame. The 1980 Princeton graduate has returned to Princeton, whether speaking at the school, attending reunions or commissioning the school’s ROTC. Milley was named the 39th Army General of the United States on August 14, 2015. The former hockey player dedicated over the last 30 years of his life to the army, serving the country in various capacities. Milley, commanded the Army Forces Command at Fort Bragg in North Carolina. (check this), also served in Afghanistan and commanded FORSCOM – the army’s largest command. Both his parents served in World War II, his mother with the Navy and father with the Marines. For the past three seasons, Liam Grande skated for the Cobourg Cougars of the OJHL, overlapping with Princeton sophomore Alex Riche. While Grande only appeared in 27 games last season, he averaged over a point per game and recorded 28 points in 27 games. He netted a career-high 59 points last season and finished his career with 126 points. I chose Princeton University because it was the best fit for me both academically and from a hockey perspective. The academic side of what Princeton has to offer is diverse and impressive. When I visited the campus it was awesome, everything from the grounds to the arena. The hockey program most suited me in terms of coaching and an ability to take my game to the next level. I am most looking forward to starting my university career. I graduated from high school two years ago and have since been playing junior hockey and working so I’m really excited to get back into the classroom and to get on the ice. I started into hockey when I was about four or five years old but I have been skating since age three. My earliest memory of hockey is playing for the San Jose Sharks in my first year of house league in my home town. From the first time I stepped onto the ice with my hockey stick, I knew I would love the game of hockey. I have never looked back! I grew up rooting for the Toronto Maple Leafs for two reasons. First, both my parents loved the Leafs, as well as my grandparents on both sides. I come from a long line of staunch Maple Leafs supporters and growing up that was the only team on the T.V. Saturday night. Secondly, my favourite hockey player of all was Mats Sundin, who was of course captain. The biggest challenge I have faced in hockey is dealing with injury that comes hand in hand with playing the game at a high level of intensity. Hockey is a rough sport and undoubtably has gotten rougher as I have moved through more demanding and talented leagues. Dealing with injury from the sideline can be challenging and frustrating, but overcoming these challenges makes you stronger as a hockey player and as a person. Keeping strong and healthy and motivated is at the centre of my game. The strangest thing I ever saw while playing hockey was when I was very young with my hockey team in Ottawa for a tournament. We were playing in the quarterfinals and were in the second period when the fire alarm in the building went off. We were all forced outside of the arena and the game was delayed. Ottawa had just had a major ice storm and the parking lot and surrounding grounds were a sheet of ice. We were all in our hockey equipment and skates so we started skating outside for fun. Eventually we were allowed to go back inside to continue to play but the sprinkler system had gone off over the ice surface and had frozen over. In our opponent’s end there was a massive hill of ice right in front of their goalie’s net and it took the arena staff an hour to chip away the ice and prep the surface. From start to finish that game must have lasted 4 hours – the longest game I have ever played. I don’t even remember the final score – I just remember what a crazy afternoon hockey game that was!!! Most influential person in my hockey career? My parents for sure. Neither of my parents played hockey but they both loved watching the game (big Leafs fans remember). Right from an early age they put me in power skating and skill development programs. It hasn’t stopped. They continue to be my biggest supporters in every aspect of my life. The amount of time and money they have invested in not just me but also my two brothers is crazy. They are, hands down, the most influential people in my hockey career. I wouldn’t be were I am now without them. From an early age my life has revolved around hockey and school so it makes sense that one of the greatest experiences I’ve had would be a hockey one. In my midget year we went to the OHF’s (provincial championships) and it was one of the greatest experiences of my life. Even though we lost in overtime in the finals, it was a great journey for me personally and for a great group of young men who skated beside me. The road getting there was tough. We had a really close team and supportive coaches and parents. Getting the opportunity to play for a provincial championship with all the pressure and excitement was a memorable experience. My academic interests are math, finance and science. Right now my plan is to major in economics. There is so much offered at Princeton that I hope to seek out other options as well. The plan is to take advantage of all the school has to offer. To win a national championship is the goal. I want to leave Princeton with the jersey in a better place than when I got there. As the captain of the Coquitlam Express last season, Jackson Cressey recorded a career-high 71 points despite missing several games due to injury. He played in 56 contests last season and scored a career-high 34 goals. He finished his career with the Express with 128 points across 198 games. I chose Princeton because the opportunity to attend one of the best schools and be a part of a great hockey program has always been a dream of mine and impossible to give up. I am most looking forward to meeting the rest of the guys and opening night against Michigan State. Vancouver Canucks as they are my hometown team. My biggest challenge was trying to stay positive and be opportunistic when I was struggling to get ice time my first year in junior. The strangest thing I’ve ever seen while playing hockey was a bench brawl we had down in Las Vegas during an Atom tournament. Attending game 7 of the Stanley Cup final in Vancouver was the most exciting experience. I plan on majoring in Operations Research and Financial Engineering. I hope to be remembered as hard-working and dependable on and off the ice when I leave Princeton. Jeremy Germain spent the 2015-16 season with Chilliwack of the BCHL. Through 76 games he posted 48 points. Prior to playing for the Chiefs, Germain played for the CT Wolf Pack after concluding his playing career at Choate Rosemary Hall. I chose Princeton because it is exceptional in both academics and athletics. I also fell in love with the school after playing in the Lawrenceville Tournament every year with Choate. I am looking forward to spending a lot of time in probably the most historic rink in the NCAA, and meeting new, exceptional people from all over the world. I got into hockey when I was around three or four, my earliest memory being a learn to skate practice at the Northford Ice Pavilion near my house. I grew up liking the Blues because of Chris Pronger, but now I don’t really have a favorite team. I fractured my leg when I was 13, which took about a year to get back up to game speed and fully recover from. There’s a lot but a personal one that comes to mind is when I shot the puck over the net, it hit the glass and came back over the net, hit the goalies back and went in. Also once in mites (about six-eight years old) a kid on the other team skated from his bench and gave our fans the middle finger. I have two big hockey influences in my dad and my grandfather, both of whom were at virtually every practice and game for the first 15 years of my life, and who both played professional hockey, my dad being a defenseman and my grandfather a goalie. When my dad and I visited my sister in Bangkok and got to explore both the city and the Thai countryside. I plan on majoring in Economics, but I like History and English as well. I hope to leave the hockey program in great shape by the time I graduate and to take advantage of as many of Princeton’s academic opportunities as I can. Joey Fallon played for the Lone Star Brahmas in the NAHL last season, recording 22 points over 51 games. Prior to joining Lone Star, Fallon skated for the Gloucester Rangers of the CCHL where he played with Princeton’s Ryan Kuffner and Max Veronneau. That season, Fallon netted 64 points in 67 games. I chose Princeton because It gave me the opportunity to receive the best possible education while also having the ability to play hockey at a high level. In addition, the beauty and the history of the campus made the choice an easy one. I am most looking forward to meeting all the guys on the team as well as my seven roommates. I started playing hockey when I was four years old. My earliest memory is me not being able to skate so I sat on the ice and used my skate as a pickaxe trying to make a hole in the ice. I grew up rooting for the New York Rangers. My dad was always a big fan so I was pretty much born into it. The biggest challenge I faced in hockey was being cut from my squirt major team. It became a turning point in my career and it really made me realize that I could not take anything for granted. The strangest thing that I have ever been a part of was winning a game in double overtime by shooting the puck from the red line, hitting an opposing defender and deflecting in the net. The person who has had the most influence on my hockey career is my dad. He pushed me hard to be the best player I could be. He has driven me to countless 6 a.m. skates and plans his whole schedule around my hockey games. As far as on the ice, my youth hockey coach, Pat Lafontaine, and my high school coach, Chris Baudo, both did so much to shape the player and person that I am. The most exciting experience I have ever had was going to Quebec City for two weeks for the international peewee tournament. I got to stay with a French billet family while playing kids from all over the world in front of thousands of fans. I have always been interested in math, science and history and I plan on majoring in economics. I hope my legacy at Princeton will be that I am remembered as a loyal and hard-working person. Derek Topatigh joins the Tigers after two seasons in the OJHL. The lone defenseman of the class, Topatigh proved he could score while playing for the Orangeville Flyers. Over 113 games, Topatigh netted 67 points. Last season the Ontario native recorded 39 points, a career high. Topatigh represented Canada East in the World Junior A Challenge and scored two points in five games. The defenseman was also named to the CJHL Prospects Game. I come from a family that has always been focused and mindful of academics, so as soon as the chance of coming to a school with a renowned academic history like Princeton and play hockey at the same time became an option, it was a very easy decision for me. To me, the game of hockey has always created the strongest bonds of my life so I am most looking forward to just meeting the rest of the guys on the team and having the chance to work alongside them to have the best possible season this team can have. I got into hockey at age three and grew up around the game. My first memory was trying to keep up with my two brothers on the local rink and just being ecstatic that I finally had the chance to go on the ice myself. Growing up in the Toronto area, I have always been a big Maple Leafs fan. Even though the team has been mediocre in my lifetime, I have always found the idea of an entire city getting behind the home team extremely fun and exciting. Being a defenseman on the shorter side, one thing you get a lot is that your size will prevent you from getting to the next level. To me, I have never found any truth to this argument but it is still something that definitely has been frustrating to hear. The most shocking thing to me is always when the glass shatters, as it is just so unexpected. I played in two games throughout my career to date in which someone [got] hit through the glass, and it definitely is not something you get used to seeing. My father has been the biggest influence on my hockey career, just with the support he has given me without wavering over the years. He has constantly been willing to help me get better and improve myself and will hop on the ice or the driveway without a second thought. This season I had the chance to represent my native country of Canada in the World Junior A Championships, and putting on the maple leaf was most definitely an experience that I will never forget in my life. I am planning on majoring in economics, and while I know I am interested in the finance and business side of things, I am keeping an open mind and not narrowing down my options too much. With a few consecutive losing seasons, I think my biggest aspiration is that our freshman class helps to complete the turnaround of the team and give us a chance to contend for a top spot in the ECAC. In July, I'll be moving this blog over to a self-hosted site - www.eyeontheprincetontigers.com. I'm really excited for the move, and the scheduled site release is for July 8, 2015 - Eye On The Tigers' second birthday. Site dedicated to Princeton hockey coverage, founded by Jashvina Shah, providing breaking news, game stories, features, photos and more. You can follow @PUhockeyblog or myself @icehockeystick. For inquiries and story tips, please email jashvinapshah@gmail.com. I don't get paid for any of this (and it's a lot of work!) so I appreciate any donations to keep this site up and running! This site is not affiliated with Princeton hockey. Your one stop for Princeton hockey coverage.